This page contains comments by readers of Artificial Intelligence: A Modern Approach. The comments are organized into sections based on who is making them: instructors, students, reviewers, authors of other AI texts, and others, as well as comments on particular chapters of the book, and the author's comments in an interview by Amazon.com. If you have a comment to add please mail it to aima-talk@yahoogroups.com (you can see the archives of this discussion group) or submit a review to Amazon.com. or to Barnes & Noble. You can also see a comprehensive list of reviews at Google Books. We provide here excerpts from reviews that have been published in Knowledge Engineering Review, Computing Reviews, Cybersecurity Canon, comp.ai, comp.ai.games, rec.arts.books.reviews, AI Magazine, AI Expert, and Artificial Intelligence. You can also see all reviews in the Internet news groups. Yet another introduction to Artificial Intelligence? Don't we have enough of these already? This was what I thought - before I held a copy of the book in my hands for the first time. In fact, this book is different in many aspects from every other general AI book you may have seen before. First of all, it's unique in the broad coverage of topics. It (almost, see below) has it all: the book's 27 chapters cover problem solving and search, logic and inference, planning, probabilistic reasoning and decision making, learning, communication, perception and robotics. And in each section you will find an incredible amount of useful and totally up to date material that has never been included in other textbooks so far. There is a lot to learn, for beginners and for advanced Al people. You always wanted to know about Socratic reasoners, demotion, the upward solution property, coercion, policy iteration, PAC learning, adaptive belief networks, convolution, bigram models, the Viterbi algorithm, skeletonization, the horizon problem and the like? Then this is the right book for you. Also the more standard parts have a lot of "nonstandard" material. The logic sections, for instance, not only give the typical introduction to propositional and first order logic together with the usual inference procedures, they also give many useful hints how to use first order logic to actually represent aspects of the real world including measures, time, actions, mental objects and the like, and they contain a lot of information about how to implement efficient logical reasoners. The section on uncertain knowledge contains an excellent introduction to probabilistic reasoning and belief networks. Moreover, it introduces decision theory covering topics like multiattribute utility functions, decision networks, sequential decision problems and dynamic decision networks. The section on learning, one of my favourites, presents all sorts of approaches ranging from "subsymbolic" back-propagation learning in neural nets, genetic algorithms, decision tree learning, explanation based learning to inductive logic programming, and it puts all these approaches into perspective. The book also contains very valuable information about how specific approaches and techniques were used in real applications, how successful they were - or why they failed. The planning section is a particularly good example of this. With this information the reader gets a pretty good feeling of what can be done at the moment, and where the big problems are. A further important aspect distinguishing this book from others is the common unifying perspective under which all the different approaches are presented. The authors view Al as the science of intelligent agent design. Under this view all the bits and pieces from various subfields of AI fit together very nicely. For novices this provides a lot of orientation. Advanced researchers get the great feeling that what they do is not only relevant to them and their little Al subcommunity. The book is very well-written and clear with an excellent balance between motivation, formalization and application. To make the underlying ideas precise the authors use easily understandable pseudo code throughout the book. Actual Common Lisp implementations of the presented algorithms are available via the Internet. The authors show a great ability to invent illustrating and entertaining examples - often reappearing in several chapters - and their style of writing is very amusing. It's just fun to read this book. After all this enthusiasm for the book, is there any wish left open? There is. I don't want to mention the few mistakes one finds, rather unsurprisingly given this is the first edition of a book of over 900 pages (of course, consistency of first order logic is NOT semi-decidable, contrary to what is stated on p277). Number 1 on my wish list is a more adequate treatment of nonmonotonic reasoning. Much excellent work has been done in this area in recent years and interesting insights have been gained. All Russell and Norvig, basically, have to say about this is: theoretically interesting but practically irrelevant. I think this is too much of an oversimplification and the topic of nonnumerical defeasible reasoning deserves more than one page in a book like this. I would hope to see one or two extra chapters on this topic in a future edition. Anyway, there can be no doubt that this is the best general AI textbook available today. If the quality of textbooks mirrors the matureness of a field AI is in much better shape than many of us may have thought. The book is a highly valuable source of information, not just for newcomers. Given its reasonable (if not cheap) price there is a pretty good chance that this will become the AI bible of the next decade. The authors have not only written an excellent textbook, but have distinguished themselves by their appraoch to presenting all the major themes of AI. For many, Artificial Intelligence: A Modern Approach is the de facto bible of artificial intelligence. It combines in-depth treatments of introductory and advanced concepts, along with historical background and accessible explanations. Including algorithms, code and pseudo-code, the book sits between master's and Ph.D. level, but is accessible to all. Your journey on the road to the application of data science should start here. From algorithmic and coding perspectives, the tools provided are powerful, though we remain some distance from machine sentience, which should never be confused with AI. Imitation remains an intriguing concept, although it is increasingly unclear whether it tests machine or human intelligence. Russell and Norvig's book will help you gain insight about this field and enable you to apply your own critique and assessment to Turing's test. The authors' approach delivers in-depth coverage of basic and advanced topics, and provides a basic understanding of the frontiers of AI without compromising complexity or depth. It conveys in-depth understanding and clear explanation of such concepts as supervised and unsupervised machine learning, and thus to the layman, an understanding of why there will be no jobs for machine learning foremen! Although the field of research has grown considerably since its launch in Turing's seminal 1950 paper, this volume represents both an access point for all interested and in-depth information for those with considerable exposure to the topic. It provides a lens which can be viewed from two directions: 1) towards the past and the history of the field to understand how we have come to where we are today, and 2) towards the future to better understand what is currently possible, and where research is taking us going forward. This highly popular text, both at undergraduate and post-graduate level, does not claim to be all-encompassing or exhaustive. However, it is a comprehensive treatment given the wide range of the topic. It comes as close as possible, at this time, to being a one-stop reference. As Einstein famously said, "Everything should be made as simple as possible, but no simpler." In the same vein, the book conveys how we can strive towards as much automation as possible, but no more than is necessary. Tacit knowledge and domain expertise remain, for the foreseeable future, beyond the grasp of AI. When it comes to context and corroboration, the input of the human analyst is invaluable. The discipline of data science requires both human and machine input. Completion of this text will help you appreciate why. While the enterprise of artificial intelligence has often been defined around the dream of intelligent agents, Russell and Norvig's book is the first attempt to present the technical accomplishments of AI to a broad scientific audience in the context of embedded agents acting in real-world environments. 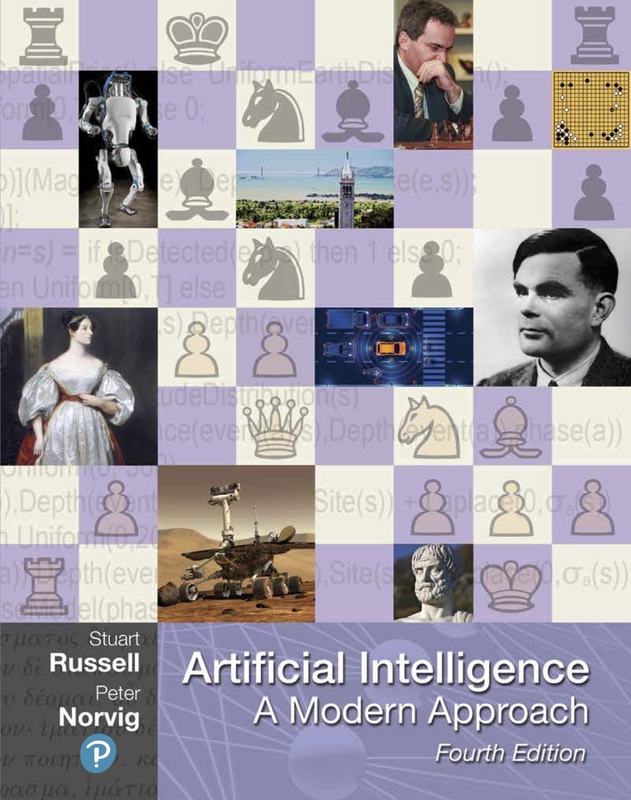 The book is not merely an expositional triumph; Russell and Norvig achieve a unique synthesis of concepts and algorithms in AI that have evolved in very disparate sub-communities of the field. The book draws on ideas from logic, decision theory, control theory, Markov processes, economics, on-line algorithms, complexity theory, probability and statistics and information theory, to coherently present methods in AI in a jargon-free manner. This makes the book an ideal introduction to newcomers to AI from computer science as well as other branches of science and engineering. For seasoned practitioners, it offers a new, thought-provoking way to understand AI. The book is organized into eight sections. The first section begins with a brief history of AI and introduces the basic vocabulary for describing agents embedded in task environments. The last section (Section VIII) comprises a beautiful essay on the philosophical foundations of AI and an engaging commentary on the current state and future challenges facing AI. The sections in between constitute the technical meat of the book. Section II highlights general problem-solving methods for embedded agents and includes informed search methods that take resource constraints into account. The third section emphasizes the role of knowledge in decision-making and presents an array of methods for representing and reasoning with logical or categorical knowledge. Section IV presents planning as reasoning about action choice; contemporary planning and replanning methods are presented as specializations of the general methods of logical reasoning introduced in the third section. Section V introduces probability and decision theory as tools for agents acting under uncertainty. It explains how belief networks can be used to represent uncertain knowledge and describes decision-making methods based on them. The sixth section focuses on learning and adaptation in intelligent agents. It presents a unified model of learning, a brief introduction to computational learning theory, as well as specific techniques such as decision-tree learning, neural networks, and a new method for learning belief networks. It also includes a tutorial exposition of recent work in reinforcement learning, as well as the knowledge-based inductive logic programming method. Section VII focuses on interactions of the agent with the external world: natural language communication, perception and robotics. Russell and Norvig have recruited established experts (Jitendra Malik and John Canny) to cover the specialized topics of perception and robotics, ensuring a uniformly high quality to all of the technical material in the book. The book is hefty: over 900 pages in all. However, almost 200 pages are devoted to items sometimes missing from AI texts: a very thorough index, a truly massive bibliography, "Historical Notes" sections that are researched in depth and make fascinating reading, and a large collection of excellent exercises. This is perhaps not the place to go through all the book's chapters in detail, but some deserve special mention. The second chapter on agents is brilliant; it puts the entire history of work in AI in perspective and explains why people built the algorithms that were built. This is the first question that most first-timers to AI have, and this is answered up front. The chapters on reasoning about uncertainty are by far the best tutorial exposition of material on probability and belief networks: they make the original papers in the area much more accessible. Judged from all respects, this is a remarkably comprehensive and incisive treatment of the field. The book is well-written and well-organized and includes uniform and clear descriptions of all major AI algorithms. The authors have managed to describe key concepts with technical depth and rigour without falling prey to stodginess and Greek-symbolitis. AI is presented as a set of inter-related design principles, rather than a grab bag of tricks. The book brims with optimism and contagious excitement about the frontiers of AI. I recommend it without reservation to anyone interested in the computational study of intelligence, whether they be undergraduate or graduate students or senior scientists in the field. About the reviewer Subramanian is an Assistant Professor at the Computer Science Department at Cornell University. Her interests are in AI, its theoretical foundations and practical applications in design, scheduling and molecular biology. She has been teaching AI at the undergraduate and graduate levels for about five years. A terrific book ... remarkably comprehensive ... not only provides sufficient background to begin serious work in AI, but also provides just necessary background: there isn't much in it that could readily be omitted by a graduate student in AI. ... Throughout the book, the writing is clear and engaging, and the authors convey an appropriately positive view of the field. To read this book is to get a sense of the intellectual substance of the field-to realize how much good work has been done in AI. ... My minor complaints aside, I've found it a pleasure to teach from this book, and I have also used it frequently as reference source. ... If you want to teach an AI course around an ``agents" theme-and I don't necessarily think that's a bad idea-this book will make it easy for you to do so, and to do so well. But even if you think that ``agents" is just the latest buzz-word, don't let the fact that this is billed as ``the intelligent agents book" dissuade you from adopting it for your class, or from buying it as a reference book. Artificial Intelligence: A Modern Approach will provide a first-rate education in AI even to the reader who skips all the specially agent-oriented material. Martha E. Pollack is associate professor of computer science and intelligent systems at the University of Pittsburg. She received the Computers and Thought Award in 1991 and a NSF Young Investigators Award in 1992. Her current research interest include computational methods of rationality, plan generation and recognition, natural language processing, and AI methodology. In 900 pages of well laid-out text, with excellent use of typography to make finding topics easy, it seems to be a great compendium of methods loosely called "AI." This book may very well be the first of the new breed of modern AI textbooks. It uses as a unifying theme the notion of intelligent agents; an excellent pedagogical starting point that lets the authors develop a very hands-on approach as well as one that naturally lends itself to the modern trend toward distributed intelligent systems. The coverage of all the basic principles of knowledge-based and learning systems is thorough and includes a wide variety of excellent problems. The logico-deductive approach is treated with exceptional clarity and depth; the text is lighter in its coverage of natural language processing and computer vision. A concluding chapter even touches on some of the deeper philosophical issues in more than a cursory manner. Outstanding ... Its descriptions are extremely clear and readable; its organization is excellent; its examples are motivating; and its coverage is scholarly and thorough! ... The authors (and their helpers) have done a remarkable job, and the field owes them a hearty thanks and "well done!" ... will deservedly dominate the field for some time. I must say that I am hugely impressed by the text book. It is rare that a textbook makes practising AIers happy. The main reason is the coherence that you brought out by using intelligent agency as the glue that binds the various parts together. I have taught this course three times before, and every time I used to dread the introductory lecture. I was disillusioned with the idea of throwing a bunch of definitions of intelligence and talking about Turing test, and asking them to take on faith the fact that representation and search are some how very important. So, I started using a second lecture that talked about planning as a representative AI problem, talking about the idea of domain independent solutions etc. While that helped the students in finding out why search/reasoning etc. is useful, in my own heart, I knew that this was not a good enough job since (what about NLP? what about learning? why learn about them?) Although I am not using your text this semester, I did decide to use the intelligent agents chapter as the basis for my introductory lecture this time. I am happy to report that for the first time, I felt I did a convincing job. I was able to use your agent architecture discussion as a background for explaining why we need NLP, speech recognition, vision, learning, logic, uncertainty, decision theory and uncertainity. What is more, I think the metaphor is so compelling that in many cases I was able to get the students to venture the correct answers about the role of these apparently disparate things that we are going to be talking about this semester. Yesterday night, I was a happy man! I started reading various chapters of your book and I am very pleased to note that the agent view is woven integrally through all of them. I think that is a great way of bringing things together, and I hope to relay some of those insights to my students. While the underlying agent view, and the integration it brings, by themselves make your textbook great, I also found that you have done a great job of explaining traditional techniques. For example, I loved your explanation of the distinction between planning and problem solving in terms of the decomposability of the goal test. Similarly, I thought that your description of hierarchical task network planning is better than that found in even some of the state-of-the-art HTN papers. I really envy your encylopaedic grasp of the subject, but thank you for writing it into a text form. I think this is definitely a watershed textbook for intro to AI courses. Great job! I decided to use your book. ... It's really good. It's going to make teaching the class a breeze. - Prof. Elaine Rich (Texas), author of "Artificial Intelligence"